INDIANAPOLIS, IN– The President and CEO of Eskenazi Medical Group and the Vice President, Diversity, Equity, and Multicultural Affairs for Indiana University Foundation along with 15 additional award recipients were honored at the Center for Leadership Development’s 38th Annual Minority Achievers Awards & Scholarship Gala. The Gala took place Thursday, March 22 in the Indiana Convention Center’s Sagamore Ballroom and OneAmerica served as the Title sponsor. The Center for Leadership Development was pleased to publicly announce a $1million gift from Derica Rice and Robin Nelson-Rice, previous press release here: Center for Leadership Development receives $1 million gift from Derica and Robin Rice. Lawrence Dewey, Chairman and CEO of Allison Transmission, also made a surprise announcement with an additional $100,000 gift. with Distinction from Colorado College with a degree in anthropology and completed medical school and his Internal Medicine Residency at the Mayo Clinic in Rochester, Minnesota. Joyce Rogers is the Vice President for Development and External Relations for Indiana University Foundation, a partner to Indiana University that is dedicated to marshalling resources to provide IU with philanthropic assets necessary to achieve its aspirations. 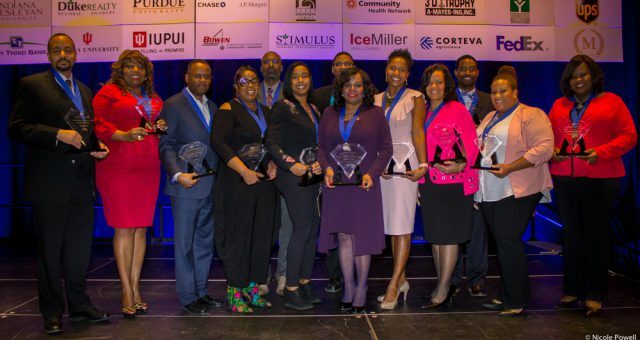 Rogers previously served as the Vice President for Development at Ivy Tech Community College, CEO and President for Indiana Black Expo and serves on several boards including The Mind Trust, the Madame C.J. Walker Theatre and Health & Hospital Corp. Joyce earned her bachelor’s degree from Indiana State University and is an alumna of Indiana University McKinney School of Law. Named in honor of CLD’s founder to recognize special, unique individuals who have made significant investments of resources (time, talent, and treasure) to help assure CLD’s existence, strength, sustainability, and growth, Bruce Hill exemplifies the purpose of this honor. Hill, a recent human resources and employee recruitment retiree of Eli Lilly and Company, has served on the CLD Board of Directors since 2005 and is heavily involved in ensuring the organizations success serving as an advocate and champion for the youth of Indianapolis. Regina, a native of Indianapolis, is a 1982 graduate of North Central High School and proud CLD Alumna. A past president of the CLD Alumni Association, she earned her bachelor’s degree at IUPUI/Purdue University and her MBA from Indiana Wesleyan University where she served as the University’s Ambassador from 2013-2015. She is currently working on a Master’s in Education from Walden University. Regina has been employed for State Auto Insurance Companies for nearly 25 years as a Premium Audit Specialist, and has been an active CLD facilitator for the last 14 years. Thirteen additional awards were presented to select individuals for achievement in categories: Arts & Entertainment, Business & Industry, Communications/PR/Advertising, Education, K-12 and Postsecondary, Entrepreneurship, Financial Services, Professions, Public & Community Service, Science & Technical Disciplines, “Up & Coming” Achiever, and Human Achievement. The event also focused on CLD’s higher education institutions and community partners who introduced the 2018 class of “CLD Scholars”. CLD’s educational scholarship sponsors help make education accessible, affordable, and achievable for CLD participants and their families. Since 2004, CLD has been in partnership with various colleges and universities throughout the state of Indiana that see the value of CLD’s programming. Over $23.7 million in scholarships have been awarded to CLD students since inception. At the Achievers Gala, $4,206,568 was leveraged to support CLD students in full and partial scholarships by 27 college, university and corporate partners.